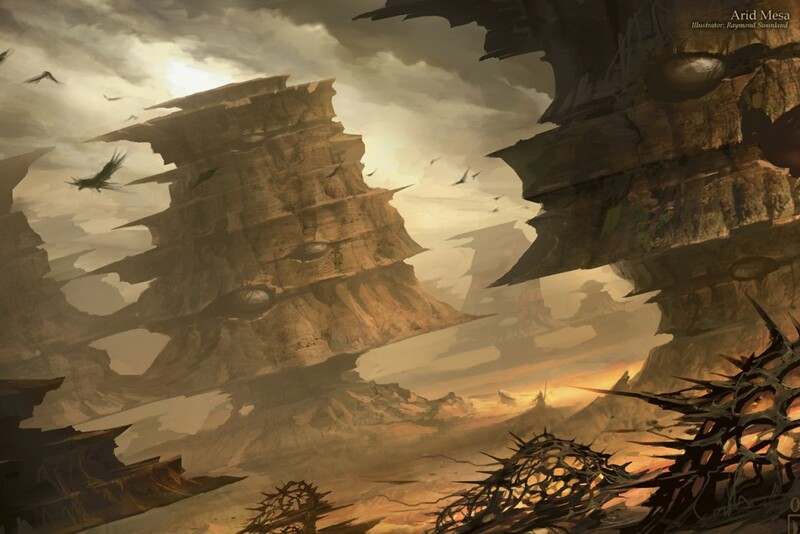 Beginning with the Future Sight expansion set, Raymond Swanland’s artwork has graced more than a hundred Magic: The Gathering cards. 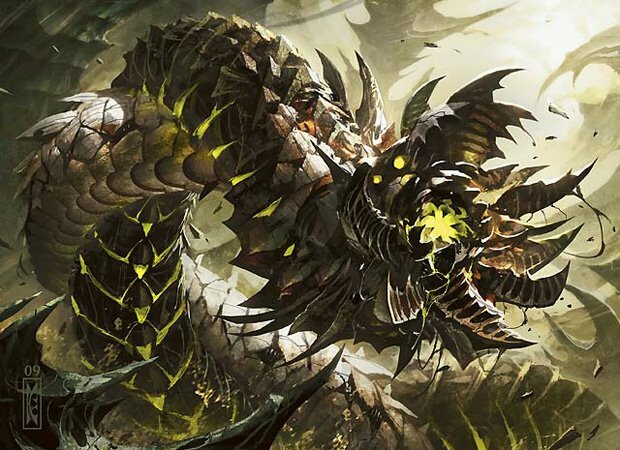 Raymond’s distinctive style — like the jagged edges of creatures like Wurmcoil Engine or the violent destruction of cards like Glare of Heresy — have helped to tell the story of the conflicts and struggles that have occurred across the MtG Multiverse. 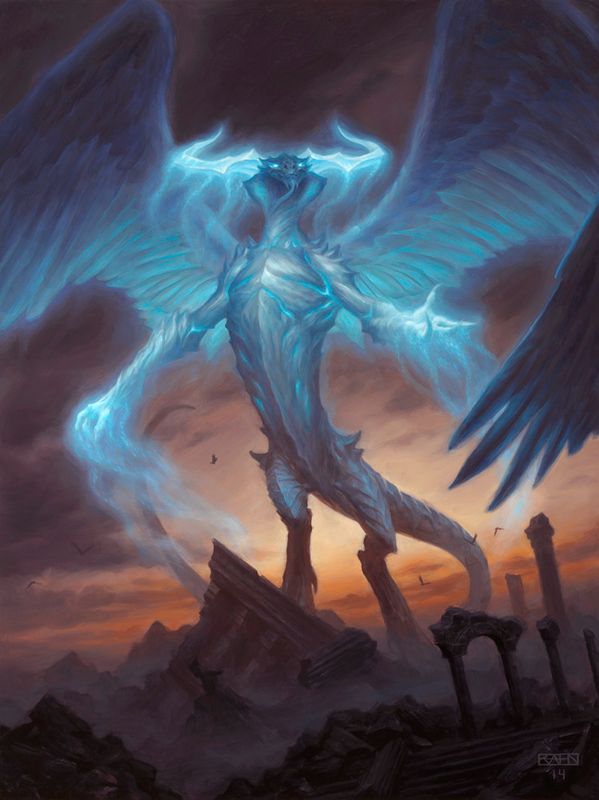 Now, with the release of Fate Reforged, the second set in the Khans of Tarkir block, Raymond has had the opportunity to introduce players to Ugin, a dragon planeswalker first mentioned in the Future Sight block. 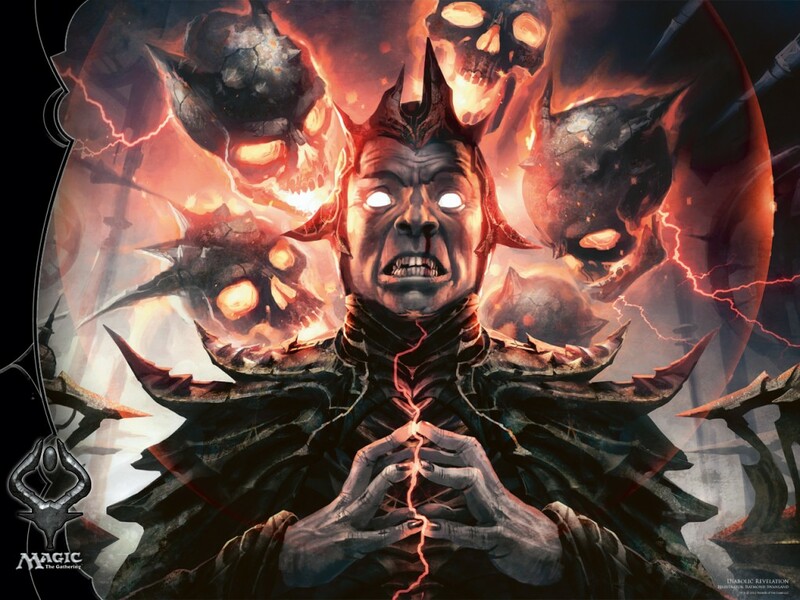 Although Ugin has been glimpsed or referenced in cards since 2007, Raymond’s artwork for the planeswalker is the first time players have seen Ugin in his full majesty. With the long wait for Ugin’s arrival finally over, Art of MtG spoke to Raymond via email about his artwork, his artistic influences and his status as Magic’s go-to fire illustrator. Art of MtG: Your output for Magic: The Gathering has been really quite prolific — more than 100 cards to date! Tell me a little bit about how you got started. What was your first MtG assignment and what was it like? Raymond: After working in the video game industry for the first eight years of my career, I went full freelance as an illustrator around 2005. At that point, I had already been creating covers, on the side, for Dungeons & Dragons’ Forgotten Realms novels through Art Director Matt Adelsperger, who had taken a chance on me a few years earlier. My first Magic assignments grew out of that cover work. D&D being under the same roof as Magic, I assume word got around, and Jeremy Jarvis, a Magic art director, reached out to me to fill in a few cards for the Future Sight expansion set. 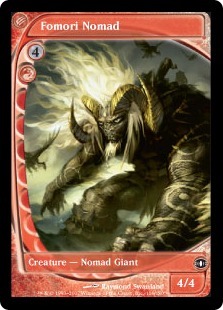 My first card was Fomori Nomad, of which I’m still quite proud. The whole process felt natural and comfortable — just the right amount of conceptual direction and artistic freedom. About a year later, I was given a huge slate of cards for Shards of Alara, and I haven’t let up since! 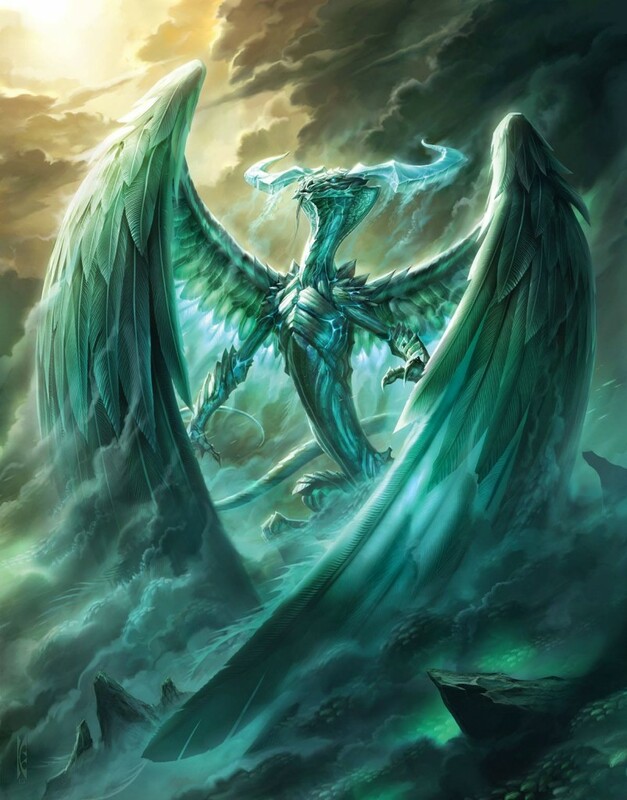 Art of MtG: Going to the other end of the spectrum, you recently did the artwork for Ugin the Spirit Dragon. If I’m not mistaken, this is the first time that players have really seen Ugin fully depicted on a card. How did you approach this assignment? Raymond: The first time you show a new planeswalker, it’s important that he/she/it be quite clearly displayed and in all of their power. In the case of Ugin, we wanted to make sure we portrayed the full scope of his anatomy and the true nature of the dragon-style energy that exudes from his extremities. I chose to portray Ugin at something like the peak of a mountain, where his spiritual status is clear and his energy is merging with the clouds and the weather. I wanted Ugin to feel that he IS a force of nature. In truth, I’m quite jealous of the alternate Ugin artwork created by Chris Rahn — it’s so atmospheric and beautiful! I’m proud of my piece, but I wouldn’t blame anyone for going over to Team Rahn. 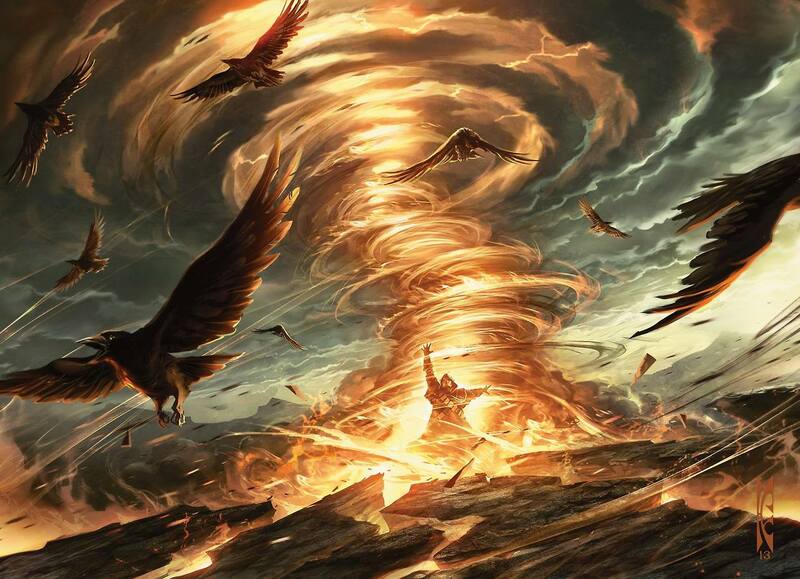 Art of MtG: You also recently got to re-imagine the card Firespout for “From the Vault: Annihilation”. What was that like? Raymond: Without really intending to, I seem to have become a bit of a go-to artist for fire effects of all kinds. When they came to me looking to create an epic tornado of fire for a classic card, I felt that I was in pretty comfortable territory. Art of MtG: You mention on your website that you’ve been extremely influenced by Joseph Campbell and Alex Grey. How do you see the work of these two luminaries seeping into your own artwork? Raymond: My influence from both Joseph Campbell and Alex Grey comes from their point of view on the purpose and legacy of art. As artists of all kinds, we’re influenced and inspired by the artists who came before us, and we should endeavor to add to that creative lineage for all the artists who follow us. Campbell would value this perspective by emphasizing that we’re part of a collective whole with common roots. He believed that artists and storytellers have the ability and, perhaps, the obligation to remind all of society about the powerful truths contained in our cultural myths. Grey would emphasize that the artist’s job is to open peoples’ minds (and their own) to larger transcendent concepts through the execution and content of their artwork. If an artist embraces this mission, it benefits everyone through spiritual growth. The way I see it, in a creative sense, Joseph Campbell is very much about looking back, while Alex Grey is very much about looking forward. Trying to achieve equal parts of both is a challenge I openly embrace whenever I launch into a new art project. I find that Magic offers a tremendous number of opportunities to embed artwork with symbols and meanings that go beyond each card itself. Also, because of the output of SO MANY excellent artists, I think Magic has the ability to go far beyond being JUST A GAME. Art of MtG: Can you give me an example of a piece of art that’s been embedded with that kind of symbolism or meaning? Raymond: I think a good example of a piece of my Magic art that offered an opportunity to tap into something more meaningful and mythic was Rescue from the Underworld. Although the Theros set was, of course, based on Greek Mythology as a jumping-off point, I used that card to tap into the kind of atmospheric existential scenes I’ve been painting since I was young. 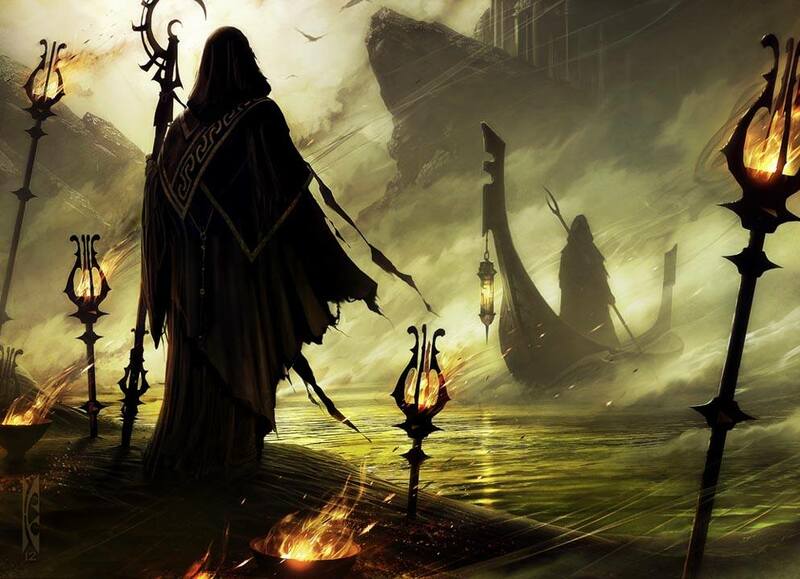 With Charon, the ferryman, crossing the River Styx to pick up the waiting passenger (or is he dropping off a resurrected soul? ), it’s clearly confronting a question of mortality through a very enduring image. I was very proud of this piece when I finished it, but I was quite surprised by the response it received from fans who noted how moved they were when they first encountered it. The image seems to tap into something more archetypal than I consciously intended. When that happens, it’s a humbling feeling. Art of MtG: You also mention on your site that you’ve wanted to work in the entertainment industry for some time and that you’ve even done some feature film development. 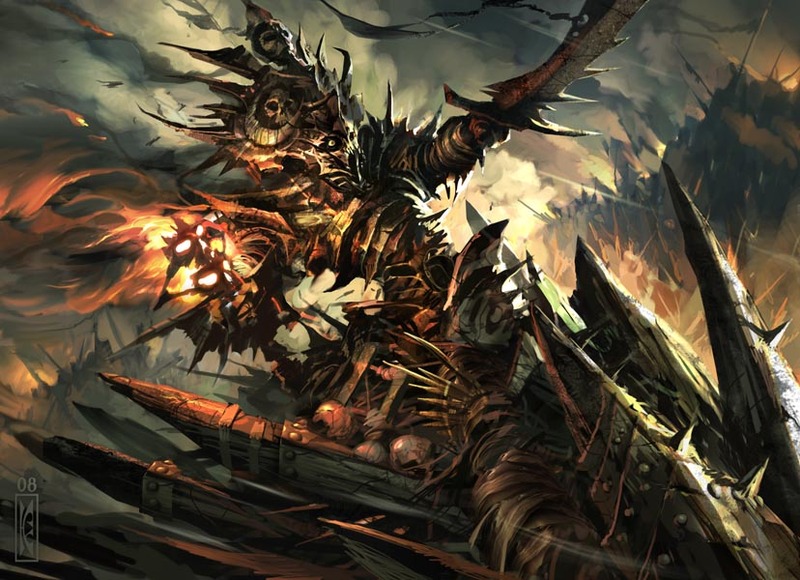 What do you think about the news of a potential Magic: The Gathering movie? Raymond: A Magic: The Gathering film certainly feels like a long time coming. However, I can see that the sheer expansiveness of the world that’s been created over the years is both a blessing and a challenge. Just figuring out where to enter the flow of the story is a huge decision that will affect the story in every way. I have a huge amount of excitement and anticipation for the project, but they certainly have their work cut out for them. Shall I even bring up the astronomical expectations of the vast hordes of Magic fans? For my part, I’m optimistic for what the filmmakers will come up with. Art of MtG: Can you tell me anything about any upcoming work you’re doing for Magic? Raymond: Ah, you should know better than to ask a question like THAT, but I know you need to try. What I CAN tell you is that my pace of doing Magic work isn’t letting up anytime soon. Art of MtG: You’re right — I had to try! Speaking of your output, how can fans learn more about you and perhaps even purchase some of your work? Raymond: I have just a limited amount of work that is available online through Acme Archives Direct, which is all work for licensed properties such as Star Wars, Aliens and Predator. All of my Magic work is available exclusively at the signing events I attend, the next of which will be in Memphis, Tenn., on Feb. 20-22. I’m planning to re-launch my personal website at RaymondSwanland.com in the coming months and making a larger range of work available as prints through the site. In the meantime, any news about my artwork can be found at my Facebook fan page. Art of MtG: Finally, would you care to name 5-10 of your favorite Magic illustrations (either works you’ve done or works you admire)?